Quite often these objectives conflict with each other. 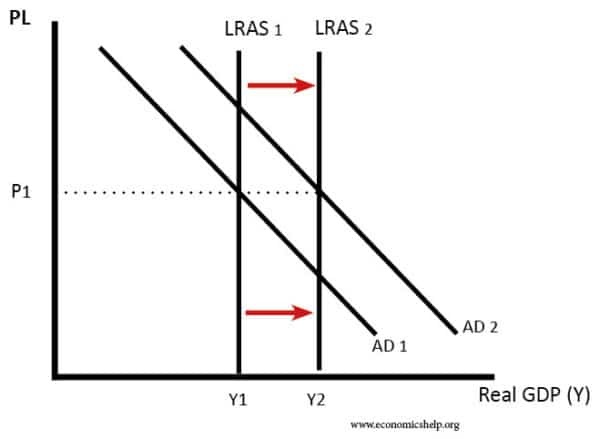 For example, expansionary fiscal policy may contribute to higher economic growth and lower unemployment; however, it will be at the cost of inflation and a deterioration on the current account. To achieve all objectives simultaneously it is essential to improve the supply side of the economy. If the government can increase productivity and shift AS to the right, it can enable low inflationary growth and help improve the general competitiveness of the economy. 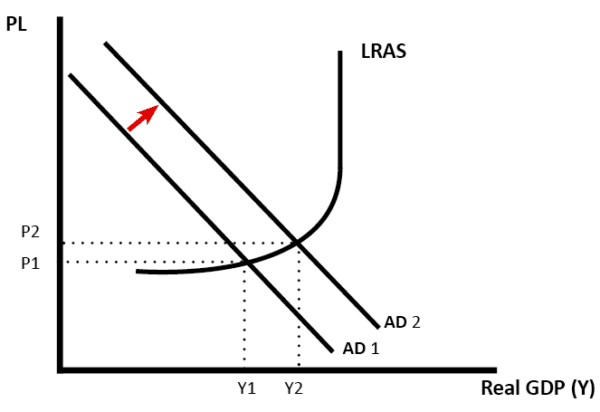 Supply side policies which shift LRAS to the right allow higher economic growth. The main limitation for increasing the long-run trend rate of economic growth is the growth of productivity (output per worker). We cannot increase the long-run trend rate of growth through demand side policies. Therefore, if the government wants a higher sustainable rate of economic growth then it requires effective supply side policies which increase this productivity. For example, effective training schemes which give workers more skills can lead to higher labour productivity. Governments could try and encourage firms to invest in more research and development by offering tax credits. If successful, these policies can enable countries to grow at a higher rate. In practice, it is difficult for government supply side policies to improve the long-run trend rate of growth. Productivity growth depends to a large extent on technological improvements. These improvements mostly come independently of government policy. Supply side policies are of great importance in reducing the natural rate of unemployment. The natural rate of unemployment includes supply side unemployment such as structural and frictional unemployment. For example, economists suggest the EU could reduce its unemployment levels through certain supply side policies. One policy could involve making labour markets more flexible. e.g the government could make it easier to hire and fire workers; this will encourage firms to invest and employ workers. Another supply side policy could involve better education and training for young unemployed people. Therefore, these supply side policies can help reduce unemployment levels. However, policies such as investing in education and training will take a long time to have an effect. Also, there is no guarantee that government supply side policies can actually reduce unemployment. For example, people may be unwilling to go on training schemes. If it is easier to hire and fire workers there may be more temporary unemployment. Also, supply-side policies cannot solve unemployment caused by insufficient economic growth. In a recession, we see a spike in unemployment as firms lay off workers. This type of unemployment cannot be solved through supply-side policies, we need higher rates of economic growth. This graph shows that in the recession of 2008/09 unemployment rose rapidly in all major economies – US and Eurozone. 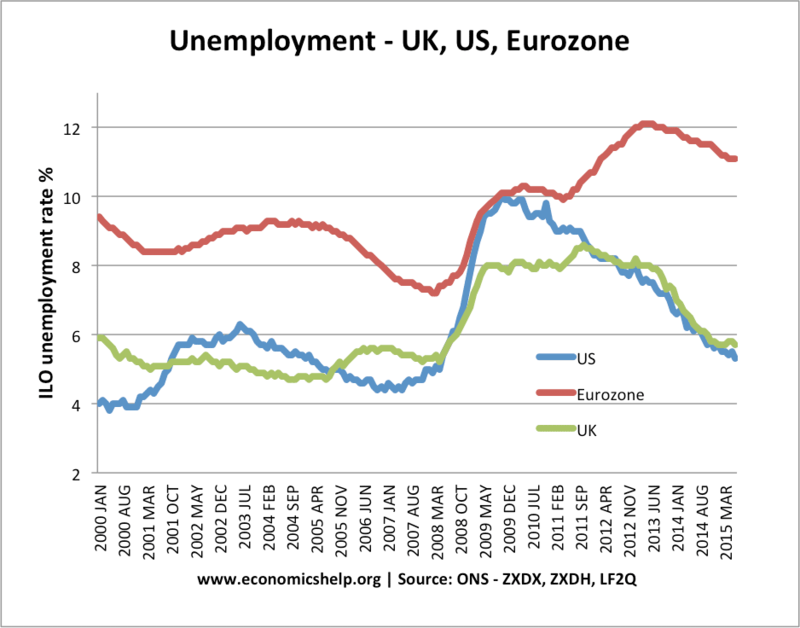 However, this graph also shows a higher structural rate of unemployment in the Eurozone. This suggests that the Eurozone need better supply side policies to reduce the rate of unemployment. For example, reduce benefits, more flexible labour markets, more support for young unskilled workers. In the control of inflation, the most significant factor is the use of monetary policy and controlling Aggregate Demand (AD) through interest rates. Supply side policies will take a long time to have any effect on reducing inflationary pressures. Increased productivity can also help the balance of payments. If firms become more competitive, then UK goods will be in greater demand, increasing exports and improving the current account deficit. Supply side policies which are important for exporters will be the quality of transport. Roads and rail-links are quasi-public goods and require government investment. Reducing congestion and supply bottlenecks can help reduce the cost for business. Supply side policies can be very beneficial with very limited drawbacks. However, in practice it is not always so easy to increase productivity. Also, there is a limit to how much benefit they can give, in a recession is often more appropriate to use demand side policies. In a recession (Y1) we need demand-side policies to increase AD. 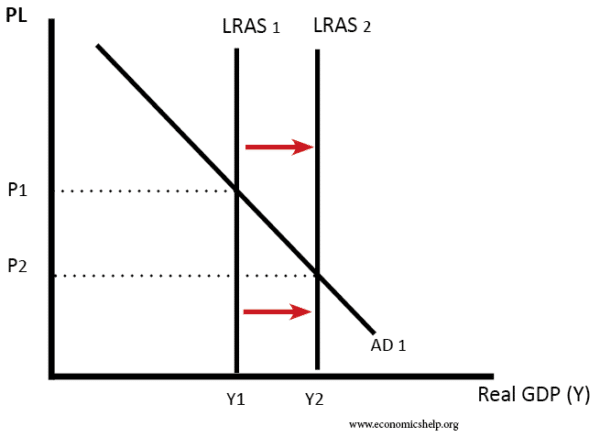 Shifting LRAS to the right will only have a very limited effect in solving the macro-economic problems. This entry was posted in supply side. Bookmark the permalink.